So I’m still looking for a sci-fi or fantasy film I’ve seen that passes the Bechdel Test. While I’m searching, let’s move on to something that seems easier at first glance: TV shows. I’ve been having some fun thinking about the Bechdel test lately, specifically how many of my favorite sci-fi and fantasy films would pass it. 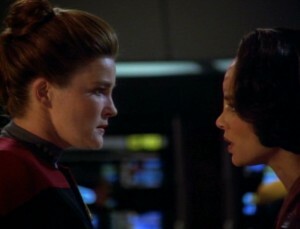 To pass the test a movie must (a) have two women in it who (b) talk to each other (c) about something other than a man. On the left, Lucas surrounded by a ton of stuff from the first Star Wars trilogy, which ended with 1983′s Return of the Jedi. On the right, Lucas surrounded by the only object that mattered in his second Star Wars trilogy, finishing with 2005′s Revenge of the Sith: A green chroma screen. I’ve been thinking about this in terms of television shows lately. On the one hand, using CG and green screens is so much cheaper that it allows shoestring indie productions to look as good as big studio stuff. (See the indie-to-SciFi show Sanctuary for an example.) On the other hand, green screens make it harder for actors to get involved, and there are lots of ways to get the visuals subtly wrong. 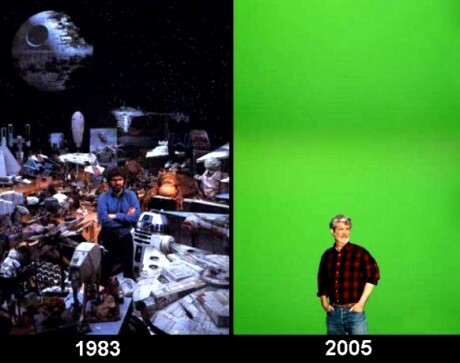 So here’s my question: do we actually need the green screen anymore? There seem to be lots of “extended super special restored director’s cut” editions of existing shows and movies now, and plenty of YouTube remasters of even the crappiest pre-digital video. None of that stock had green screens or motion dots or matchmove data, so why can’t we shoot new video without all those things? As an intermediate step, would it be possible to dress a set the way you might for a stage play, then fill in the screen-quality props and sets digitally? Can actors look out a cardboard window at a black cloth with stars painted on it, but viewers see a porthole with galaxies whizzing past? That way, you don’t have to make the decision between the on-stage prop and the virtual one until you’re in the editing room. Who knows? You might just decide to leave the cardboard in. A belated Happy Towel Day to everyone! Towel Day is celebrated every May 25 as a tribute by fans of the late author Douglas Adams. On this day, fans carry a towel with them to demonstrate their love for the books and the author. The commemoration was first held in 2001, two weeks after Adams’ death on May 11, 2001.